Last night we tucked into a meal of fish curry with Basmati rice, ooh-ing and aah-ing because it had been two weeks since we’d last eaten rice and we’d forgotten how much we loved it. “Slimming AND healthy!” I commented. Then we settled down in front of the TV, tuned into Channel 4’s Dispatches, and discovered rice is a rich source of arsenic, causing something like one in five deaths in Bangladesh. Baby rice was the first food we gave our daughters when they were weaning – yet Heinz’s baby rice was found to contain a level of arsenic at 129 parts per billion – 28.9 per cent above recommended levels for babies and children. Other kid friendly rice foods were even worse. Kallo’s healthy sounding organic puffed rice cereal had 323 parts of arsenic per billion (ppb), while Organix organic wholegrain baby rice had 268 ppb – 168 per cent above recommended levels for babies and children. Kelloggs Rice Krispies had 188 ppb. Baby organic rice cakes by Boots were found to be 162 ppb, and Organic wholegrain banana porridge by Organix at 142 ppb. The good news? Basmati rice contains the lowest levels of arsenic. The bad news? Red camargue rice contains the highest. 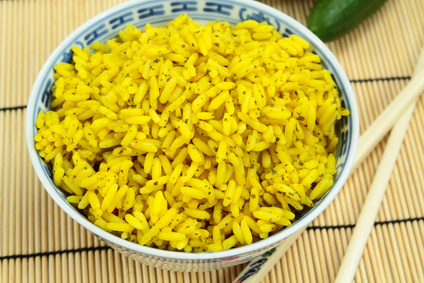 Dispatches’ tip for rice lovers: rinse it thoroughly before you cook it. Cook in plenty of water. AND then rinse again with boiling water before you serve it. Portion control Peel the fear… Have your cake – and drink it! Are you at risk of osteoporosis? When is the best time of day to moisturise your skin? Is veganism really good for your health?